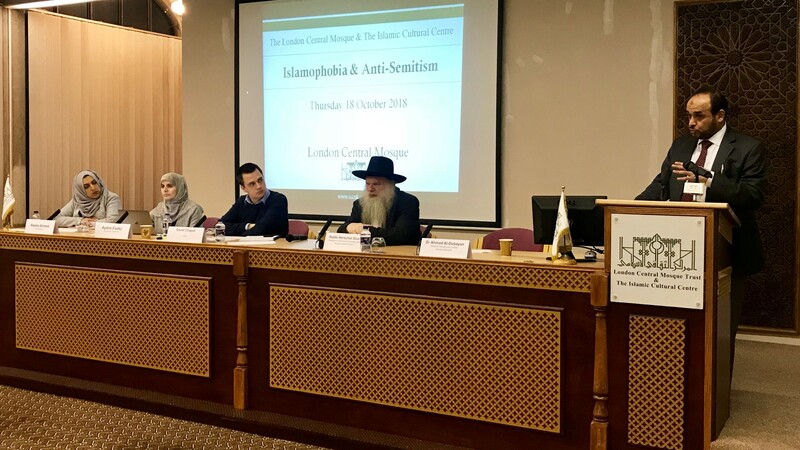 Islamophobia & Anti-Semitism Forum held at The Islamic Cultural Centre. 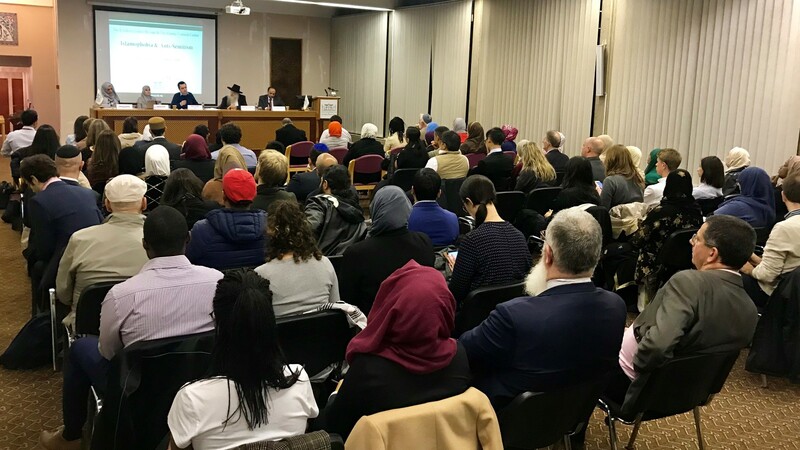 An event on Islamophobia & Anti-Semitism, organised by the Home Office in cooperation with Islamic Cultural Centre, London was held on Thursday, 18 October, 2018. 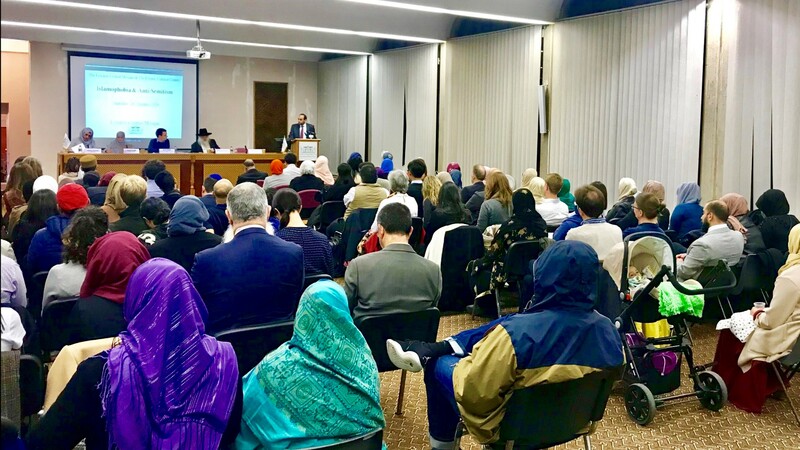 Speakers included the Director General of The Islamic Cultural Centre & The London Central Mosque Dr Ahmad Al Dubayan, Rabbi Herschel Gluck and Aysha Esakji Counter Extremism - Home Office. 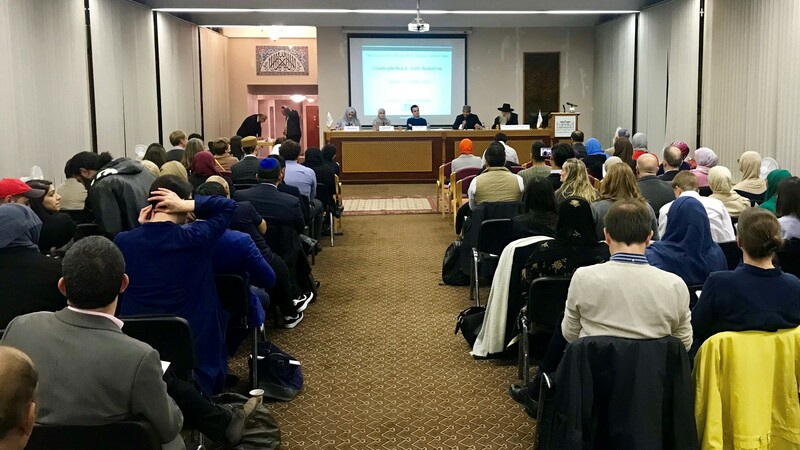 Dr. Ahmad al-Dubayan, Director-General of the Islamic Cultural Centre & The London Central Mosque addressed the gathering and spoke on Islamophobia. He started with Assalamu Alaikum wa Rahmatullahe wa Barakatuh and mentioned, "This is the way in which Muslims greet each other; of course I know all of you or at least in this Mosque you know Salam, it means peace, which is in Hebrew Slaoum. Peace be upon all of you; actually we wish peace will be with you all the time. First of all thank you very much for organising this event here today at the Islamic Cultural Centre. We are so happy to have it here today; thank you to all of you; who come here today." Speaking on Islamophobia, Dr. al-Dubayan first of all explained how the modern world turns into a small global village and how modern technology brings them together, "Indeed the subject today Islamophobia and Anti-Semitism is really something very very important. I believe something really, in this time now, in this modern time when the entire world comes closer to each other; countries come closer to each other politically, economically, technologically, now the modern technology also brings them together. We are not now in a world of like before, i.e. anybody can live isolated, or live by alone from other people, from other countries, or other communities, or other societies. You can not today; you have to live within the world so what was said during the 50s that the world is going to be a small village; it's now happening today. When we think about this as a principle; that means, of course, we expect from this world which is going to be a small village is to have more chances to know each other; have more chances to have knowledge about each other; and Islamophobia or Anti-Semitism they are really against this directly." Dr. al-Dubayan while going into the subject of Islamophobia, he traced the background of Islamophobia and Anti-Semitism. He said, "Islamophobia is one of the phenomenons that is we are attending or we are having in these days. Of course, it is not totally new; it started long time ago; some centuries ago, but actually in the modern time, in the last thirty years we see it now more and more. There are, of course, many reasons for this. What we have here in the Qur'an translation read by Sheikh Kazi when he read these verses from the Qur'an which is saying; Allah Subhanahu wa Taala created you in races, nations, so that you can know each other; not of course to fight each other, not to hate each other. And one of the main things in Islam very clearly said in the Qur'an and in the Hadith, the Traditions of the Prophet (peace be upon him), i.e. people are equal; there is no superiority or inferiority for anybody either he is white or black, Arab or not Arab." 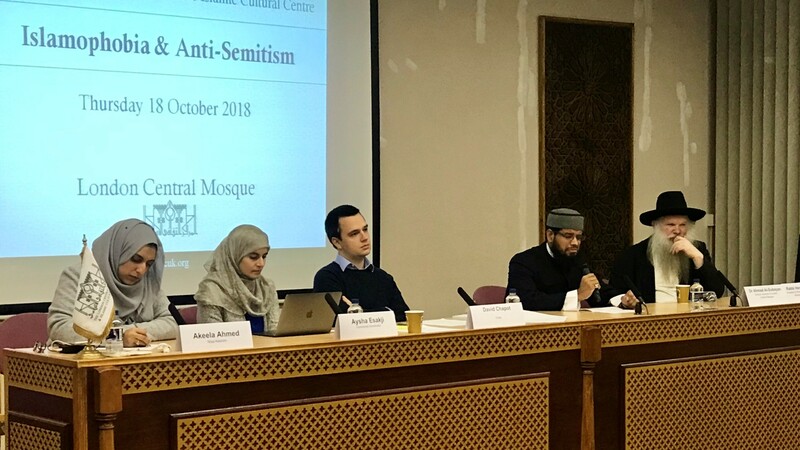 While quoting the Qur'an and the Hadith on the equality of human being, Dr. al-Dubayan explained how Islamophobia and Anti-Semitism go against this fundamental principle. He said first: "This is very clear in Islam; very clear in the Qur'an and very clear in the Traditions of the Prophet (peace be upon him); and we believe also this is the message of all religions revealed to Mankind. It is not possible that is to have God who can speak to some people and leave others; who can have some people as private and leave the others He does not speak to them. We are all equal to humanity; we are all the same." "We see this Islamophobia or Anti-Semitism is really against this; is against them. It is one of the phenomenons now we should really as communities to stand together against and really try to clarify this and try to fight it by all means and by all possibilities," he said. Going back to the history of Anti-Semitism, Dr. al-Dubayan mentioned hatred is the basis of this. He said, "Let me recall something; call something from history; anti-Semitism what we call it the Jewish question. It started in the nineteenth century; it was something like Islamophobia today. Anti-Semitism, the hatred for the Jewish people in Europe at that time. That time actually nobody stood against it clearly and using all the possibilities and possible means during those days till that led to what we know about it, of course, in the thirties and the forties when the holocaust happened. This is going exactly we have fears that is going to lead to the same result of Islamophobia if actually in Europe we stand and we leave it as it is and we don't fight it; or we don't try all the possibilities possible solutions to stand against that." "If people of the world had stood against anti-Semitism in the nineteenth century or in the early twentieth century, we would not have seen actually the result that we had seen during thirties or forties. I am sure about that. Many people ignored it or neglected it or supported it even. Some thinkers even supported in those days for many reasons; now we saw what that led to. I think the future of Europe and the whole world really is in danger if we, or if the world really remains silence against all these movements against certain people in the world, either sectarianism or Islamophobia, or anti-Semitism. Any movement actually against any race or any nation in the world is really something must be stopped and must be addressed and we should not really be quiet about it. In Europe recently and unfortunately recently we see there is a rise, really the rise of Right-wing, you know, in all Europe; in many countries; and we are really so worried; all Muslim communities, not only Muslims, but also many people, Jewish community are also worried, and other people are so worried about it; what is going to happen after this; is this going to continue?" The ICC Director General mentioned the reasons for this happening. It is misunderstanding and misinterpretation particularly about Islam. Dr. al-Dubayan said, "There are, of course, many reasons for this; most of them are economical reasons; sometimes misunderstanding; and we as Muslims suffer a lot from this misunderstanding and misinterpretation particularly about Islam in the media and this misunderstanding and this narratives really in the media which supports this misunderstanding of Islam worrying us too much. I think this disserve also all the interfaith and dialogue works we are doing in this organisation." Speaking about the role faith leaders can play, Dr. al-Dubayan mentioned, "There are many leaders in all the communities; Muslim community, Jewish community, Christian, Hindu, Sikhs and others. They are many of them really leaders in dialogue and they are always trying to open more spaces for understanding and for knowledge about others. But these people who support this Islamophobia feeling around us, they are killing the chances more and more." 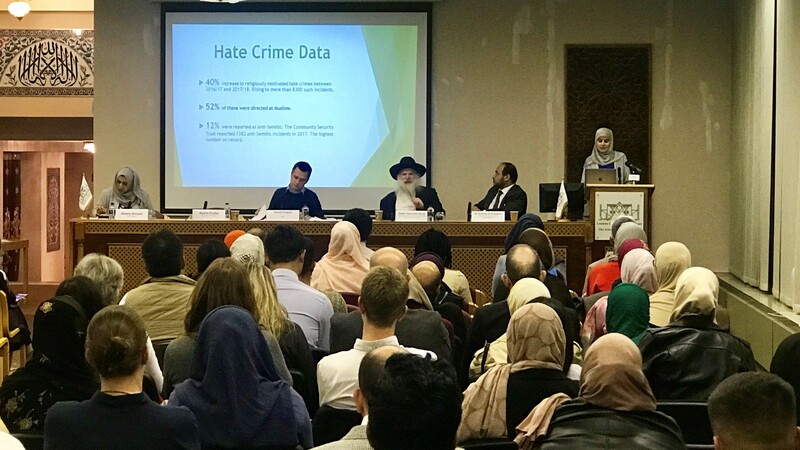 Talking about the facts and figures of the rise of Islamophobia, Dr. al-Dubayan said, "Really shocking that number; we know 40% the hatred crime really increase since 2017. This shows us actually the situation in the society and at the same time this shows us how big the responsibility we have all against this; especially of course the authorities, especially the security authorities." 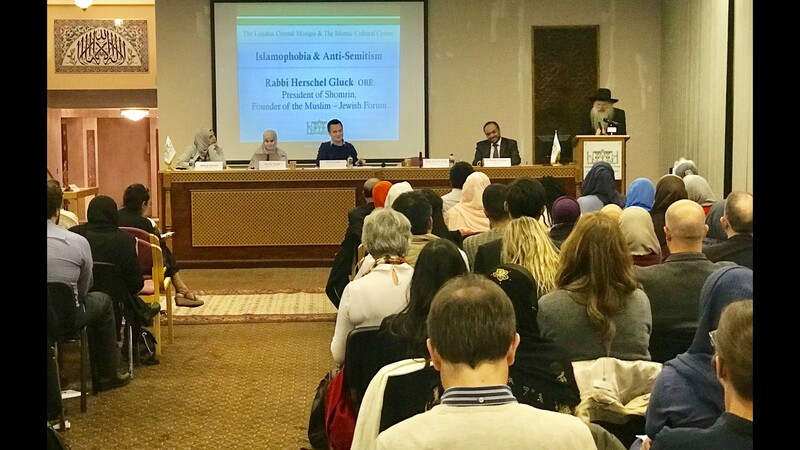 Under this present situation, Dr. al-Dubayan suggested to build a common culture among all the communities about Islamophobia and anti-Semitism. He suggested, "I believe I can refer to some of them; one of the things we really have to do we really need to build a common culture among all the communities about Islamophobia and anti-Semitism, about any kind of hatred targeting anybody, not only Muslims or Jews, but anybody, any kind of hatred. This cultural hatred must be stopped. And this actually retrieving history; history could be a very good teacher if we really learn from it; but history could be also a big and crazy monster if we try to bring the history as it is and live within the history itself. This is very dangerous. And I don't need to refer to some countries in the world what is happening there; because of something happened a long time ago, a history sometimes a killer if we don't understand." "So building a common culture and awareness in all the communities about this thing; we have to show really the face of the faiths; faiths must speak up and must be talked about it. 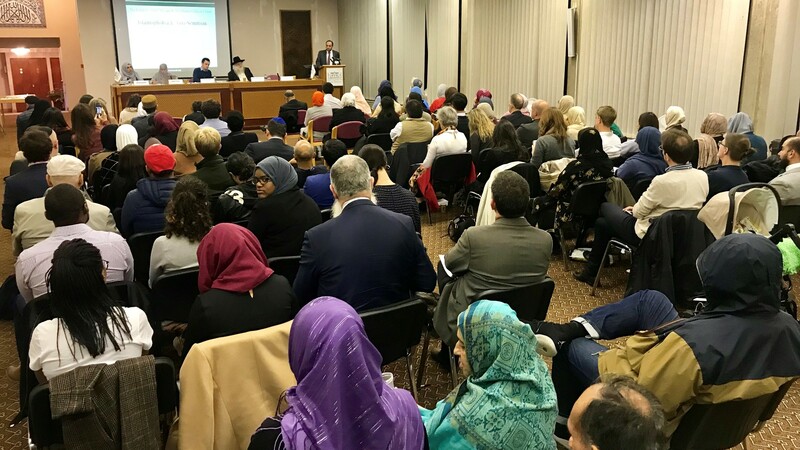 Every faith leaders must educate his community through the organisation about this phenomenon about themselves; Islamophobia, anti-Semitism; this must be addressed by Imams, by Rabbis, by Priest, by also Monks and by everybody," said Dr. al-Dubayan. The ICC chief said, "We need also to clarify this misunderstanding about Islam itself; we are doing a lot, but this is not enough. Now there also the internet; internet is a school which is available but can teach something good and can teach something bad. So how to encounter this; how we can stand against that or clarify all situations; how we really can reach these people who spread hatred and targeting people. Then we really need to think about that; we need to have initiatives." Dr. al-Dubayan also suggested welcoming the tolerant voices. He said, "These tolerant voices must be raised and must be welcomed. This is actually the model we have to follow; we have to raise it and we have to always highlight among the society, and especially targeting the fresh mind, the youth mind, they are really the future; so we have to build for the future from now. Very very important." While concluding his speech and welcoming all speakers, friends, ladies and gentlemen, Dr. al-Dubayan again mentioned, "I think it is a very important issue; and if we don't convey the message; this message of tolerance from community to community; from each community to another community, I think we are going to fail. When we fail then there is really something very dangerous for all the societies and for all of us because we are all standing on one boat and hatred does not know borders. When you allow for it will go actually destroying and I think the history and in the present time there are lot of examples and all of you know this example. We don't want to happen again, either in the UK or anywhere else." The event was started with Quranic Recitation by Sheikh Luthfur Rahman Kazi, an Imam of The London Central Mosque.